The story so far: Arkham House’s major multi-author state-of-the Mythos anthologies – Tales of the Cthulhu Mythos, New Tales of the Cthulhu Mythos, and Cthulhu 2000 – held a special position in Cthulhu Mythos fandom, but come the 1990s this was challenged by other sources. 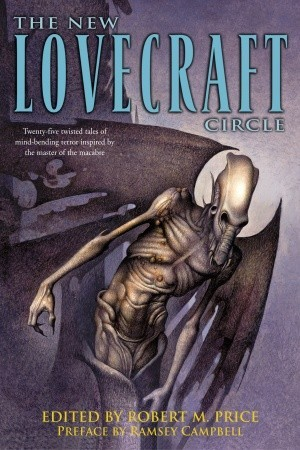 One of those was Robert M. Price’s two-part alternate take on the original Tales of the Cthulhu Mythos, the first half of which – Tales of the Lovecraft Mythos – dredged up some diamonds but was also hampered by some utter dross, included more out of historical interest than out of any actual quality involved. The second half of Price’s attempted riposte to Tales of the Cthulhu Mythos follows the lead of the second half of that tome, focusing on authors who had not been in correspondence with Lovecraft in his lifetime. The title is a nod to Lin Carter, a friend of Price whose work Price has tried to keep in the public eye even when the results aren’t actually that flattering to Carter and who had identified a set of new authors such as Ramsey Campbell and Brian Lumley as constituting a sort of “New Lovecraft Circle”, though I am not sure there is sufficient social glue between these writers (beyond that which naturally exists between writers working in the same genre for the same general audience, feeding from the same trough as it were) to really compare to the circle of friends around Lovecraft. Among H.P. Lovecraft’s more laudable qualities was his eagerness to encourage other writers in their work, a trait that would develop early in his amateur press association writings and would continue right up to his death. Two of his later proteges were Robert Bloch and Henry Kuttner, two pals who were both fans of his work. (Kuttner, in fact, would only correspond with Lovecraft in the last year of Lovecraft’s life). Though their early work involved a lot of Lovecraftian pastiches, they would each grow to be distinctive authors in their own right. Bloch is mostly famous today as the author of Psycho, whilst Kuttner would become extremely well-regarded in the science fiction, both in his own right and his creative team-up with fellow Lovecraft correspondent C.L. Moore, who he met and later married as a result of their mutual inclusion in the network of authors around Lovecraft. Lin Carter, once again demonstrating that despite his deficiencies as an author he was certainly a discerning editor, hit on the idea of publishing collections of the Cthulhu Mythos stories of both authors. In his lifetime he did manage to put out the first edition of Mysteries of the Worm, the Bloch collection, named in honour of the Mythos tome that Bloch invented and added to the canon; unfortunately, he never got around to producing the intended Kuttner-focused equivalent, The Book of Iod. When Carter’s friend Robert M. Price ended up overseeing Chaosium’s Call of Cthulhu fiction line, he naturally made reprinting an expanded version of Mysteries of the Worm and bringing The Book of Iod to fruition an early priority. As a result, it’s now pretty easy to get a good look at this early work by both authors, with both collections putting the stories in chronological order of publication and, as a result, offering a cross-section of their early development as authors. Roleplaying game publishers getting into fiction publishing is nothing new, and often doesn’t earn high praise. A major exception over the years has been Chaosium’s fiction line, which has generally been rather special. Although its pace of publications has waxed and waned over the years as a result of Chaosium’s various business troubles, it’s usually been of a bit more interest than your typical fantasy RPG tie-in fiction range. A large part of this comes from the fact that Chaosium’s major lines have involved very distinctive settings. Their first games, including RuneQuest, introduced the world to the idiosyncratic world of Glorantha, and though they haven’t put out an enormous amount of Glorantha-based fiction those pieces they have, such as King of Sartar, is generally well-loved by fans of the setting. The cult classic RPG Pendragon, a game of playing not just single knights but entire family dynasties set against the pseudohistorical backdrop of the rise and fall of King Arthur, gave them all the prompting they needed to seek out and release some high-quality Arthurian fiction. Chaosium’s most high-profile and widely-loved game, however, is the Call of Cthulhu RPG. On release in 1981 it became the first majorly successful horror-themed roleplaying game, and even though Chaosium themselves have had their fortunes wax and wane and wax again over the years Call of Cthulhu has retained a major following, with extensive support from fan writers and third-party publishers bolstering Chaosium’s offerings and extremely healthy fan communities thriving across the world. I could write an entire article about the secret of its success, but in summary I’d say it’s the combination of a fairly intuitive game system with a cerebral, investigative style of RPG play that instantly creates a contrast with more action-oriented games, along with the distinctive flavour offered by being set in the world of the Cthulhu Mythos. It’s no surprise then, that out of all of Chaosium’s games, Call of Cthulhu has the most extensive fiction line associated with it – especially when you consider the simple advantage that even before the game came out there were numerous stories written in the Lovecraftian vein by a wide range of authors. As a result, whilst Chaosium have put out original collections of new Mythos fiction too, a good swathe of their Call of Cthulhu fiction range consists of reprints of classic Mythos stories, as well as tales that influenced the early Mythos writers (such as the supernatural tales of Robert Chambers). Some of the more interesting reprint collections offered by Chaosium have been the author-specific ones, which allow for a complete overview (or at least an informative cross-section) of an author’s Mythos-relevant writing to be collected between two covers.